For a long time, many companies had only one way to capture visitors to their website: contact forms. Lengthy lead forms became the lifeblood of modern customer acquisition. But more and more businesses are starting to ask, why do we make people fill out forms just to talk to us? Why aren’t we trying to connect and speak with them when we have their attention? That’s what live chat tools for sales teams make possible. When a person comes to your site, engages with your content and says, “Hey, I want to talk,” you can use live chat to speak with them right then and there. Combine that with the fact that you are 10x less likely to ever connect with a lead if you wait just five minutes to reach out, and the evidence is clear: live chat can help sales teams turn impersonal funnels into personal, real-time connections – the kind of connections that grow your pipeline and your revenue. So how do you prepare your sales team to sell in live chat? On the surface, the live chat sales funnel works in much the same way as the traditional funnel. You execute demand generation programs to drive visitors to your website, qualify them, nurture them into sales opportunities and convert them into paying customers. The big difference is with the live chat funnel, you do this in real-time, which requires sales teams to exercise a few new muscles. Here are 3 critical skills that sales managers need to help frontline reps build in order to maximize the benefits of live chat. There’s a common misconception that implementing live chat means your reps talk to everyone who raises their hand. That’s not the case. We still qualify to determine if the lead is a good fit for our products. You can keep qualification efficient by enriching leads through a third-party or pulling in data you already have in your CRM. 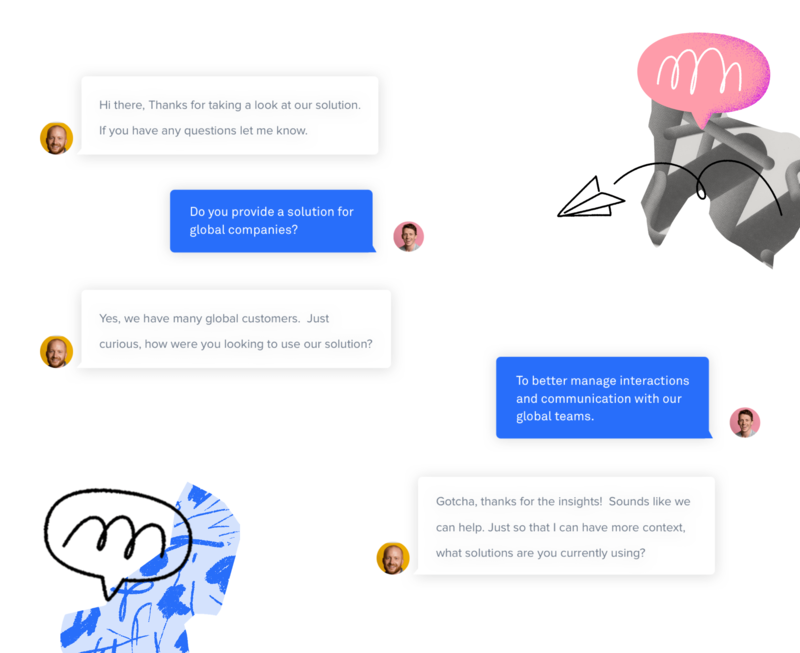 Chatbots like Intercom’s Operator can also collect data and ask additional qualification questions on your reps’ behalf to determine which leads should route to your sales team. Once reps have connected with a lead on live chat, it’s important for them to remember they’re having a conversation with the person on the other end. That means a warm introduction, being personal and answering the prospect’s questions before earning the right to ask their own – just like what you would do if you were talking face to face. By doing this, reps will be able to give helpful context for the qualification questions they need to ask and build trust with the lead. Reps shouldn’t be afraid to show some personality either – they’re human and their lead is too! Sales managers, be sure to adjust your dashboards and KPIs to account for real-time metrics, such as first response time. Live chat makes sales teams more efficient, not less, because your reps can handle at least 20% more live chat leads per person than they can traditional web form leads. But to excel, they need to know how to handle the different questions prospects will throw at them and do it in real-time. We know that prospects do their homework in advance and research solutions on websites before reaching out. So first-time conversations with your reps will run the gamut, from detailed pricing inquiries, to technical product questions, to tough questions about how you stack up against your competitors. Since the conversations are live, reps need to give prompt replies that have just the right level of depth to build credibility while moving the conversation forward. That means more than ever they need to practice and prepare by leveraging battle cards, tailoring sales scripts to real-time conversations, and role playing. At Intercom, reps go through chat-specific training and certification programs to verify that they have successfully gained these skills. When the rep has qualified a lead and addressed their top concerns, it’s time to move leads onto the next step — schedule a meeting, follow up over email, close a deal, or drop leads into a nurture track until they’re ready to buy. Many of these steps are similar to the steps reps take with leads who filled out a form. Loop in teammates for real-time discovery: If reps realize their lead is qualified and eager to go deeper, they can instantly pass the chat to an available account executive and have the lead move on to discovery. Share case studies and other content that’s relevant to their prospect’s use case directly in the chat. No more email back-and-forth or phone tag. Close deals in real-time: Your team can even help the prospect complete a purchase in the same conversation. With Intercom’s Messenger apps, they can start a video call or screenshare in the live chat to give an instant product demo. Moreover, reps can convert or upgrade leads as they chat using the Stripe Subscription app. With live chat, as with any other sales channel, your sales team needs to flawlessly execute selling fundamentals — prospect, qualify, and convert leads. But the real-time nature of live chat requires reps to develop a few more skills to effectively engage with people who are on your website and ready to move forward in the buying funnel. Help your team develop these skills and you’ll be on your way to capture more ROI for your marketing spend and build a stronger pipeline. Want to hear more lessons I’ve learned implementing and managing a live chat sales funnel? Check out my talk at this year’s Revenue Summit.